COLORADO SPRINGS, Colo. - The Sky Sox dropped game one of Monday's doubleheader against the Oklahoma City Dodgers 7-1, forcing a game two that would decide the division champs, in a winner-take-all contest. Game two also went to the Dodgers, 16-4, as Oklahoma City won the Pacific Coast League American Northern Division. For the second game in a row, Oklahoma City scored in the top of the very first inning. Connor Joe led off with a walk for the Dodgers, moving up to second on a Henry Ramos single. Edwin Rios then hit an RBI double to score Joe for the first run of the game. Matt Beaty followed up with a two-out RBI double of his own, plating both baserunners to give the Dodgers an early 3-0 lead. After a scoreless second, the Dodgers scored again in the top of the third inning. Rios hit a one-out single, coming home one out later on Beaty's second RBI double of the day to make it a 4-0 ballgame. In the bottom half of the frame, the Sky Sox found their way onto the board to break up the shutout. Dylan Moore led off with his second single of the day, followed up by a Nate Orf single. Tyrone Taylor was then hit by pitch to load the bases for Christian Bethancourt, who grounded out, scoring Moore from third to make it 4-1. In the top of the fifth inning, Oklahoma City extended their lead. Joe kicked off the inning with his second leadoff walk of the game, advancing to second on a ground out, and to third on a flyout. A wild pitch would allow Joe to trot the last 90 feet home to give the Dodgers a 5-1 lead. In the seventh inning, the Dodgers tacked on. Travis Taijeron and Joe led off with back-to-back walks, with a Ramos single loading the bases. Rios then hit an RBI single, scoring both Taijeron and Joe to make it 7-1 Oklahoma City. That score would hold as the Dodgers took game one. In game two, the Dodgers scored in the first inning yet again. Ramos and Donovan Solano hit back-to-back one-out singles, Taijeron walked to load the bases, and Beaty hit a two-RBI single to give Oklahoma City a swift 2-0 advantage. The Sky Sox answered in the bottom of the first. Moore led off with a double and Orf drew a four-pitch walk, followed by a Taylor walk to load the bases with no outs. With Bethancourt at the plate, a wild pitch allowed everyone to move up 90 feet, with Moore coming home to make it 2-1. Bethancourt then hit a sacrifice fly to score Orf from third and tie up the game. In the top of the second frame, Oklahoma City retook the lead. Jake Peter led off with a double on the first pitch he saw, moving up to third on a Daniel Corcino single. Joe followed up with an RBI single to give the Dodgers a 3-2 lead, still with no outs in the inning. Ramos then singled home Corcino to extend the lead by another run. Solano hit into a double play for the first two outs of the frame, scoring Joe in the process to make it 5-2. The Dodgers scored for the third consecutive inning in the top of the third. With the bases loaded and two outs on the board, Joe hit another RBI single to score both Beaty and Will Smith to make it 7-2 Oklahoma City. A Ramos single and a Sky Sox error on the play allowed Peter to score to make it 8-2 with three-and-a-half innings left to play. In the fifth inning the Dodgers scored another pair of runs. Peter drew a one-out walk and Tyler Goeddel walked to put two on. Joe then hit his tenth double of the season to plate Peter. Solano hit a sacrifice fly to score Goeddel to make it 10-2. In the bottom of the sixth frame, the Sky Sox reduced the deficit to seven runs. Dustin Houle, who had just entered into the game for Colorado Springs, hit a double on the first pitch he saw. Emilio Bonifacio then also hit a double, scoring Houle from second to make it 10-3. In the top of the seventh inning, Oklahoma City scored another six runs to make it 16-3 to put the game and the division title out of reach. In the bottom half of the final inning, Moore hit a solo home run to make it 16-4, which would prove to be the final score as the Dodgers competed the doubleheader sweep, taking the division in the process. For all information on Sky Sox, follow along on Facebook, Twitter, and Instagram, and visit the team's website at www.skysox.com. Roll Call: With Nate Orf appearing in both games Monday, Orf appeared in 322 regular season games with the Sky Sox, passing Tim Wheeler and finishing in 13th place all-time in Sky Sox regular season games played. With Tristan Archer's relief appearance in game two on Monday, that marked Archer's 94th regular season game pitched with the Sky Sox, passing Andrew Johnston for sole possession of 13th place all-time in Sky Sox regular games pitched. Tim Dillard's pitching appearance in game two was his 109th regular season game pitched, finishing in 7th place all-time. Sweet Total: Rick Sweet finishes with the Sky Sox as the winningest manager in Sky Sox history at 282-275-1, a .506 winning percentage. Including the postseason, Sweet's record finishes at 284-278-1 (.505). Hit By Tim: The hit by pitch by Tim Dillard in game two on Monday was his 10th this season, and 30th HBP in his Sky Sox career. Dillard holds the career mark, five more than Jason Young. Orf Alert: The walk by Nate Orf in the first inning in game two on Monday was his 136th career regular season walk, moving past Jason Bates and Matt Miller into sole possession of 7th place all time on the Sky Sox career walks list. The tying run in the bottom of the first inning by Orf was his 220th career run scored in the regular season, also in 7th place in the Sky Sox runs scored list. Streaky: Mauricio Dubon had the longest hitting streak for the Sky Sox this season at 23 games, which ran from April 10th to May 5th. The streak ended for the season on May 5th, when he was lost for the rest of the season from a torn left anterior cruciate ligament in his knee. Dubon's hitting streak ties for the fourth-longest in Sky Sox history. Here is a list of the longest hitting streaks in Sky Sox history: 29 games - Trenidad Hubbard (July 5th [G1] to August 7th, 1995); 29 games - Matt Murton (April 15th to April 27th and June 6th to June 21st, 2009); 25 games - Jim Tatum (July 3rd [G2] to July 2nd, 1994); 23 games - Wayne Kirby (June 2nd to June 27th, 1992); 23 games - Neifi Perez (May 1st to May 23rd, 1996); 23 games - Ben Petrick (May 20th to June 20th, 2000); 23 games - Garrett Atkins (June 14th to July 9th, 2004); 23 games - Mauricio Dubon (April 10th to May 5th, 2018). While Dubon's hitting streak ends in Colorado Springs, it is still considered an active PCL hitting streak, and Dubon will get the chance to extend his hitting streak next season in 2019. Nate Orf had the next-longest hitting streak in 2018 for the Sky Sox with a 20-game hitting streak from April 18th through May 10th. A Look Back: As the Colorado Springs Sky Sox wind down their 31-year Triple-A run in the Pacific Coast League, here are a few items of note. 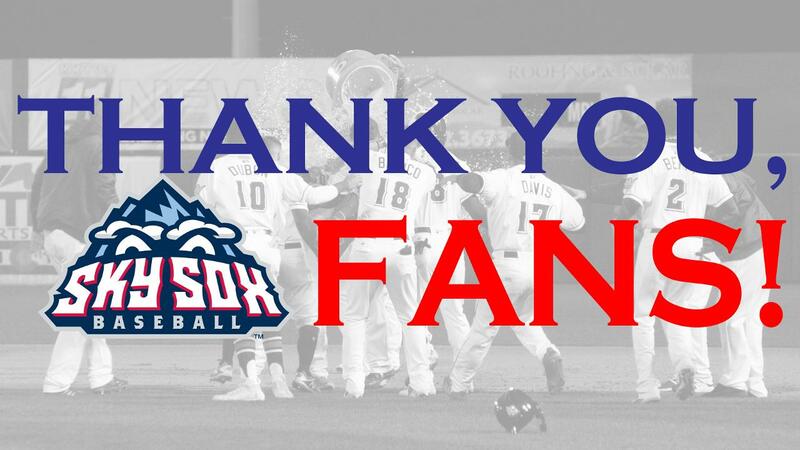 With Monday's attendance finale total of 5,684, the Sky Sox 2018 regular season attendance total finishes at 262,657. The 31-year Triple-A Sky Sox home attendance mark finishes at 7,846,949. This year on the road, the Sky Sox compiled a road total of 436,597, putting their 31-year road attendance grand total to 12,127,289. Through Monday, the all-time record for the Triple-A era of the Colorado Springs Sky Sox stood at 2,134 wins, 2,260 losses, and two ties (1,189-997-1 at home, 945-1,263-1 on the road). Broken down by games played in each time zone: In the Mountain Time Zone, the Sky Sox were 1,391-1,257-1; in the Pacific Time Zone (+ Arizona road games), the Sky Sox were 457-617-1; and in the Central Time Zone, the Sky Sox were 286-386. If you include the Sky Sox postseason record (20-23 overall), the grand total is 2,154 wins, 2,283 losses, and two ties. > Sky Sox vs. Albuquerque Dukes (1988-2000) and Albuquerque Isotopes (2003-2018): Sky Sox 153-159 in regular season (80-73 in CS, 73-86 in ABQ); 5-9 in postseason (2-3 in CS, 3-6 in ABQ). > Sky Sox vs. El Paso Chihuahuas (2014-2018): Sky Sox 8-9 overall (3-6 in CS, 5-3 in ELP). > Sky Sox vs. Fresno Grizzlies (1998-2018): Sky Sox 93-110-1 overall (54-47 in CS, 39-63-1 in FRE). > Sky Sox vs. Iowa Cubs (1998-2018): Sky Sox 107-118 overall (62-52 in CS, 45-66 in IOW). > Sky Sox vs. Las Vegas Stars (1988-2000) and Las Vegas 51s (2001-2018): Sky Sox 199-185 in regular season (112-81 in CS, 87-104 in LV); 3-2 in postseason (1-1 in CS, 2-1 in LV). > Sky Sox vs. Memphis Redbirds (1998-2018): Sky Sox 87-104 overall (52-44 in CS, 35-60 in MEM); 2-3 in postseason (1-2 in CS, 1-1 in MEM). > Sky Sox vs. Nashville Sounds (1998-2018): Sky Sox 90-102 overall (50-47 in CS, 40-55 in NAS). > Sky Sox vs. New Orleans Zephyrs (1998-2016) and New Orleans Baby Cakes (2017-2018): Sky Sox 111-83 overall (54-41 in CS, 57-42 in NO). > Sky Sox vs. Oklahoma Redhawks (1998-2008), Oklahoma City Redhawks (2009-2014), and Oklahoma City Dodgers (2015-2018): Sky Sox 89-107 overall (53-43 in CS, 36-64 in OKC). > Sky Sox vs. Omaha Royals (1998, 2002-2010), Omaha Golden Spikes (1999-2001), and Omaha Storm Chasers (2011-2018): Sky Sox 105-123 overall (60-56 in CS, 45-67 in OMA). > Sky Sox vs. Reno Aces (2009-2018): Sky Sox 42-56 overall (23-24 in CS, 19-32 in REN). > Sky Sox vs. Round Rock Express (2005-2018): Sky Sox 52-60 overall (24-28 in CS, 28-32 in ROU). > Sky Sox vs. Sacramento River Cats (2000-2018): Sky Sox 74-117 overall (40-55 in CS, 34-62 in SAC). > Sky Sox vs. Salt Lake Buzz (1994-2000), Salt Lake Stingers (2001-2005), and Salt Lake Bees (2006-2018): Sky Sox133-153 in regular season (71-71 in CS, 62-82 in SL); 3-2 in postseason (2-1 in CS, 1-1 in SL). > Sky Sox vs. Tacoma Tigers (1988-1994) and Tacoma Rainiers (1995-2018): Sky Sox and Tacoma tied 174-174overall (103-67 in CS, 71-107 in TAC). > Sky Sox vs. Calgary Cannons (1988-2002): Sky Sox 87-83-1 overall (51-36-1 in CS, 36-47 in CGY). > Sky Sox vs. Edmonton Trappers (1988-2004): Sky Sox 87-97 overall (52-44 in CS, 35-53 in EDM). > Sky Sox vs. Phoenix Firebirds (1988-1997): Sky Sox 92-85 in regular season (50-38 in CS, 42-47 in PHX); 0-3 in postseason (0-2 in CS, 0-1 in PHX). > Sky Sox vs. Portland Beavers (1988-1993 and 2001-2010): Sky Sox 105-95 overall (59-41 in CS, 46-54 in POR). > Sky Sox vs. Tucson Toros (1988-1997), Tucson Sidewinders (1998-2008), and Tucson Padres (2011-2013): Sky Sox 170-163 in regular season (93-70 in CS, 77-93 in TCN); 4-4 in postseason (2-2 in CS, 2-2 in TCN). > Sky Sox vs. Vancouver Canadians (1988-1999): Sky Sox 76-77 in regular season (43-33 in CS, 33-44 in VAN); 3-0 in postseason (2-0 in CS, 1-0 in VAN). Taylor Extends To 14: Outfielder Tyrone Taylor extended his hit streak Monday to 14 games after going 1-for-3 in game one. Over the 14 games, he was 22-for-55 with seven runs, a triple, three home runs, and 18 RBI. Taylor's streak ended when he went without a hit in game two on Monday. Two-Out Scoring: Nine of the Dodgers' 11 runs on Sunday night in game two came with two outs. In the fourth inning, the Dodgers scored all five of their runs with two outs. 67 players: With Danny Reynolds' appearance in the 7th inning on Sunday night, Reynolds becomes the 67th player to play for the Sky Sox this season (32 position players, 35 pitchers), tying the 2005 season for the most players used in a season. That season (2005 record 65-78), the Sky Sox had 34 position players and 33 pitchers used. Reynolds becomes the 1,095th player to play for the Sky Sox during the 31-year Triple-A history (517 position players, now 578 pitchers). 829 of the 1,095 players have played at least one game in the majors. In the Club: Christian Bethancourt and Tyrone Taylor marked their 20th homers with the Sky Sox Sunday night and are only the second and third players during the Brewers affiliation to have a 20-homer season with the Sky Sox (other: Matt Clark, 20 HR in 2015). This is the seventh instance where two Sky Sox teammates have had 20 homers or more in a season (1988 - Luis Medina 28, Rod Allen 23; 1994 - Jim Tatum 21, Ty Van Burkleo 21, Chris Jones 20; 1995 - Harvey Pulliam 25, Jay Gainer 23; 1999 - J.R. Phillips 41, Chris Hatcher 21; 2000 - Phil Hyatt 36, Scott McClain 25; 2004 - Andy Tracy 33, Brad Hawpe 31; 2018 - Christian Bethancourt 20, Tyrone Taylor 20. Late Magic: The Sky Sox late rally in the opening game of the series improved the team's record to 9-39 when trailing after six innings.